Unfold the pastry sheet on a lightly floured surface. Roll the pastry sheet into a 10x14-inch rectangle. Place the pastry sheet onto a baking sheet. Brush the pastry sheet with the mustard. Fold over the edges 1/4 inch on all sides, crimping with a fork to form a rim. 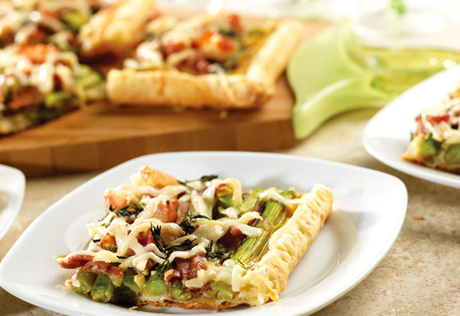 Arrange the asparagus on the pastry in a single layer. Sprinkle with the prosciutto, cheese and thyme. Bake for 20 minutes or until the pastry is golden brown and the asparagus is tender.